This pedigreed pie place is on track to become a Victory Park destination. What to expect: Chef and owner Charlie Green knows his way around a pizza oven. He made his name at the 900-square-foot Olivella’s, close to SMU. He nearly triples that size at Neo, a pizzeria and bar in Victory Park. June 1 was opening day. The setup: You can enter the restaurant two ways: through the entrance on Victory Park Lane or through the bar, Slice, which faces Houston Street. There are patios on both sides. We dined on the patio on the Victory side, which has a great view of the dog park just across the street. Said my friend, “I love that they don’t even pretend to use doggie bags.” Neo itself is dog-friendly, with big bowls of water and jars of bones. Bonus: parking is free (for two hours), right across the street, and plentiful. On the menu: Neo offers antipasti (caprese salad, meat and cheese platter, bruschetta), salads (caesar, the Olivella with mixed greens and gorgonzola), entree salads, pastas (ravioli, clam linguine), sandwiches (hot and cold), and of course, pizza. We asked our server which to choose. He recommended “the Dream,” which made my stomach hurt just thinking about it—it comes with mozzarella, gorgonzola, chicken, pancetta, and jalapenos. There’s also the Della Carne, a “meat extravaganza.” But we decided on the Neo, since it is the signature pie, and the description boasts “extra creamy mozzarella,” made in-house. A simple tomato sauce and fresh basil rounds out the dish. This was a good pizza. A super thin, crackery crust with a chewy outer rim was topped by a light sauce, pieces of basil, and blobs of mozzarella. About the cheese: it was good, but extra-creamy? Not so much. And for the price, I think the difference should be noticeable (more on that below). Our server said the regular size is enough for one or two people, and I would say that if you’re ordering a salad or starter, the regular size is fine to split. But eating a whole one yourself wouldn’t be a problem because it has such a thin crust. 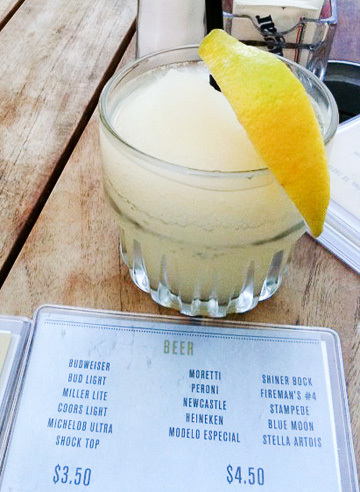 The frozen Limontini. Tastes great in the summer heat. Drinks: I don’t normally like frozen drinks, but man, it’s hot out there. The Limontini, with limoncello and vodka, sounded refreshing, and it was. So was the price: $2 during happy hour. I finished it in about four seconds. Neo offers cheap drinks until 7 p.m., with $2 frozens, wells, and domestics. They have a full bar and a wine list with bottles from California and Italy, with several under $30 (including the house chardonnay and cabernet, both $22). Who was there: This was a super-casual crowd. Girls in bathing suits and cover-ups, a group of doctors in scrubs, another table in shorts and tees. Where to sit: The interior is lovely and sleek, with concrete floors, hangar door windows, Dallas Brick walls, and a dangling light bulb for a light fixture. The interior reminded me of ‘inoteca in NYC, which is probably on purpose–the group searched restaurants on the Lower East Side for design inspiration. But once we went out back to Slice, the “sports bar” that faces HoustonStreet, we went “Ohhhhh. This is the place to sit.” The windows were open to the street, and the room (separated from the main dining area by a hallway where the bathrooms are) felt like a cozy little spot you might actually find in Manhattan. There are a few TVs, but this didn’t feel like a sports bar to me. It’s cute. There’s even a view of the downtown skyline from the shady patio. Price: This is the only thing to quibble with. $18 is high for the pizza I ordered. I’m assuming the cheese drives up the cost, but a similar pie at Campania is just $8. The other pizzas are in the $12 to $17 range, and the sandwiches are $9 almost across the board. Everything on the menu is under $20, but I would rethink that $18 pizza if I was in charge. Nice detail: A stack of colorful magnets on each table for guests to take home. The takeaway: I’ll definitely go back to Neo. 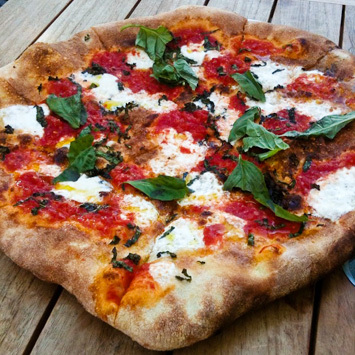 I want to sit on the patio at Slice, sip another $2 drink, and try the black truffle pizza. Or maybe the Della Casa. Or maybe even The Dream–but that one I’m splitting. Find more information on Neo here.